We have puppies, older pups, and young adults available! We may even have a retired one available! We have boys and girls, blue merles and black tris! Many with blue eyes, and even blue eyed tris! We have tiny toys, toys, and minis available! We are currently running specials on most of our available pups, many are $1000 off for a limited time! If you have been waiting for an All-Star pup of your own, now is a good time! If you are interested in adopting one of our puppies, please scroll down to the very bottom of the page and download our All-Star Puppy Adoption Application in pdf or doc format. Then fill it out in detail and submit it to us at AllStarAussies@gmail.com You must submit an application to be considered for adoption! If you already submitted your application, then thank you very much! Make sure to be most detailed about what kind of pup and personality you are looking for so we can match you with the perfect pup for you and your family! What size/weight, age, coat color, eye color, purpose, and personality traits are you looking for in a pup? Let's work together to find the best match for you! Thank you for being patient during this long and intricate adoption process! It is well worth the wait since your puppy will be your loyal and devoted companion for 15 years! We are located in Southern California and will personally deliver your puppy to your home for their 2 hour adoption appointment to go over their adoption paperwork, training, and get them acclimated to their new family and home! Our puppies also go home with an All-Star Puppy Starter Kit which includes a bag of their holistic puppy food, a clicker, a folder with their adoption paperwork, and various other goodies for your puppy! Your puppy also goes home started on potty training, crate training, and obedience training! Imagine telling your adorable new puppy to sit and they already know how! We do not ship puppies, however we have flown with two puppies in the cabin with us up to Northern California to deliver them to their new families. So we offer this puppy nanny personal delivery service as well! You can also fly into an airport and meet us there for the adoption appointment, and then fly back with your puppy in the cabin with you! However, we prefer to personally deliver puppies directly to your home in the Southern California area so that we can provide the smoothest transition for your pup into their new home! If you decide to adopt, here is how the adoption process works. Puppies are matched via puppy personality descriptions, the adoption applications, puppy photos, and desired traits. This gives you a full picture of the puppies and which one is the right match for your family. Once you have been matched up with your puppy, and your application has been approved for adoption, the next step is to sign a puppy deposit contract and put down a $500 deposit via PayPal or Citi Popmoney. Once the deposit and contract has been received your puppy will be marked “ADOPTED!” on our website. Next, I will send you the puppy transition email with information about what he/she is used to and what I would recommend to get and set up for your puppy’s homecoming. Then we will figure out the best day and time for you to schedule your puppy adoption appointment when I will personally deliver your puppy to your home, and help transition him/her to his/her new family and environment. I have delivered puppies to Pacific Palisades, Westlake Village, Manhattan Beach, Los Angeles, San Diego, Hollywood, Venice, and several other places. One of our puppies even went to a professional athlete on the LA Galaxy Soccer Team, an actress, a professional musician, and someone who worked on American Idol! Personal delivery allows for the puppy to have a smooth transition into their new homes and the puppy adoption appointments typically last 2 hours. On the adoption day, I will bring him/her to your home and introduce him/her to you, show their new potty area, their new bed, new crate, and get him/her acclimated to his/her new home and family. I will demonstrate all of his/her training commands for you and show you how to continue with his/her training. In his/her all-star puppy kit you will receive a tote bag with our logo on it, a brand new clicker, a bag of his/her holistic puppy food, and a folder with all of his/her adoption paperwork and information. I will go over all of his/her paperwork with you in detail. I will also show you what to do to help him/her bond quickly with you. I’m also available to answer questions or give advice at the adoption appointment and after he/she goes home. My goal is for you to have the best family companion and help him/her transition smoothly into his/her new home! I encourage all families to keep in touch and send photos and updates so I can see my pups growing up! If you are interested in adopting a puppy or finding out more information, please download our All-Star Puppy Adoption Application below in pdf or doc format. 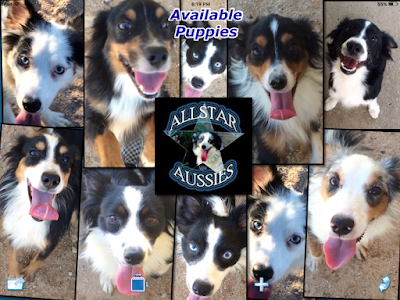 Then fill it out in detail, and submit it to us at AllStarAussies@gmail.com You must submit an application to be considered for puppy adoption! Thank you! I will be adding more, but for now here are some of our featured pups that are available! He is a gorgeous, sweet, friendly, happy go lucky, playful little guy! He is a silly goofy little goober! When he is happy he does the bambi, which means he bounces around like a little deer. It's cute and so is he! He has gorgeous, distinct, matching tan markings that make him such a handsome little cutie pie! He even has brown boot like markings on his feet which make him look like he's wearing some fancy brown Stetson boots! He is large toy/small mini sized at about 15 lbs with a tall slim athletic type of build, sort of like a deer or gazelle, but he should gain a few pounds as he fills out to maturity. He is currently on special for $1000 off for a limited time. He is a sweet tiny toy little guy! He only weighs about 8 lbs full grown and is tiny enough to take everywhere with you and fly in the airplane cabin with you! He is tiny puppy size and cute forever! He has gorgeous deep copper markings! He is currently on special for $1000 off for a limited time. He is a sweet, happy go lucky, playful little guy! He has gorgeous copper markings too! He is large toy/small mini sized at about 15 lbs but should gain a few pounds as he fills out at maturity. He is so cute with his big chocolate brown eyes that melt your heart! He is currently on special for $1000 off for a limited time. He is a gorgeous blue merle boy with a sweet, happy, playful personality! He has a gorgeous blocky head and muzzle and a stocky muscular body. He is so handsome! He is large toy/small mini sized at a heavy 20 lbs, short and stocky. He is currently on special for $1000 off of his premium price. He is a laid back, calm, sweet boy that just wants to please you and be your trusty sidekick or best friend! He has a service dog therapy dog type of personality and intuition. He is a sweetheart and such a good boy! He has a gorgeous show coat! He is a medium mini size that is about 25 lbs and around 16-17 inches tall. I would love to see him go to a home where he can serve as a therapy dog or service dog. He is currently on special for a limited time, until I fully train him again, then his price will go back up to premium prices again. Adopt him now for less! Here is his whole webpage where you can see his puppy pics and his puppy training video! He is so gorgeous that I often call him Mr. Majestic! He is just so handsome and sweet. He has a laid back, calm type of personality. He is large toy/small mini sized at about 15 lbs now, but he should reach a stocky 20 lbs when he fills out at full maturity. He has a gorgeous blocky head and muzzle and a gorgeous show coat! He looks so much like a small brown eyed version of his champion daddy Zen Buddha! He is premium priced. Leo is a spunky, happy go lucky, sweet, playful guy! He loves his toys and will carry them all around with him. He would make a great best friend, buddy, or sidekick! He would love to be your running partner, hiking partner, beach buddy and would be great for an active family. He would be great at frisbee and agility! He is about 17-18 inches tall and about 30 lbs full grown. He is a rare double blue eyed black tri from some of the most highly sought after lines in the world - the ghost eyes line, and he looks just like him! He is a full brother to my champion blue eyed tri stud Zen Buddha. He is available as a pet only on a neuter contract and may be neutered before leaving. I would like to see him go to an active family or preferably someone that will do doggie sports with him such as frisbee and agility. I think he would also do well as a best friend for a teenage boy. He would normally be premium priced as a rare double blue eyed tri, but he is currently on special with the brown eyed black tri boys. This is because he is an adult and I would just like to see him placed in the perfect home, since I have chosen not to keep him in my breeding program because I already have his champion brother. He is a gorgeous double blue eyed tri boy! He does have a little bit of brown at the top of one eye, but it's usually not noticeable, only in certain lighting conditions. He is a silly, goofy, fun loving, happy go lucky, playful little guy! He is so cute and handsome too! He is large toy/small mini sized at around 15 lbs but might gain a few pounds as he fills out to full maturity. It is rare to find a double blue eyed tri as small as him available, and as a pet. Most blue eyed tris are held back for breeding programs or sold only to breeders. However, all of my pups go on spay/neuter contracts to the best pet homes only! He will go as a pet only on a neuter contract, as all of mine do. He is premium priced, serious inquiries only. She is a double blue eyed blue merle girl with the most exotic markings! She is so gorgeous! She has some of the prettiest blue merle markings I have ever seen. They are very clear and distinct, with exotic flair. She also has ears that stand up which give her a unique style all her own. She has a very sweet, friendly, happy go lucky, wants to go up and say hi to everyone personality! She likes to go say hi to people and pets alike! She would love to be your sidekick and go everywhere with you meeting new people and seeing new places! She is about 15 lbs and should fill out and gain a few pounds as she matures because she has a stockier build. She is large toy/small mini sized which is the perfect size to carry around or go anywhere with you! She has a gorgeous blocky head and muzzle like her champion daddy Zen Buddha. She is premium priced, serious inquiries only. More pictures and puppy pic slideshows will be added to the last few pups soon! Also available and coming to this page soon! Jessie, Misty, and Preston! Keep checking this page for frequent updates and send in your adoption application if you are interested in adopting one of our pups!